Both of these guys are clear-cut Hall of Famers as nobody needs to debate the credentials of Griffey, one of the greatest center fielders ever, and Piazza, the greatest hitting catcher of all time. Griffey came three votes shy of being unanimous and who wouldn't love to get the reasoning behind those who didn't have him on their ballot (while I would accept the reasoning of that he was such a lock to get in, it made more sense to use that ballot spot for somebody who needs it, I won't accept the nonsense logic of nobody has been unanimous before so nobody ever should). And with Piazza, he should have gotten in on the first ballot but he has been hurt by a whisper campaign about potential PED usage. Another guy who has been hurt by a whisper campaign is Jeff Bagwell who ended up 15 votes shy of induction this year. Bagwell should already be in by now but his wait will come to an end next year. Another player who is getting closer to induction is Tim Raines, another guy who should have already gotten in but has been criminally overlooked over the years by the writers. Raines was 23 votes shy of the 75% threshold and with next year being his final year on the ballot, he looks close enough to getting in. Of the notable folks making their debut on the ballot, Trevor Hoffman was 34 votes shy of induction while fellow closer Billy Wagner only debuted with 10.5% of ballots while Jim Edmonds only got 2.5% of the vote. As I noted a week ago, I think it's a joke that Edmonds fell off the ballot so quickly and I don't get why Hoffman will get inducted within the next two years while Wagner will never come close when the latter was the better pitcher. Notable players falling off the ballot thanks to exhausting their amount of eligible years are Alan Trammell (sadly) and Mark McGwire. Next year will be the last year on the ballot for the aforementioned Raines, Lee Smith and Fred McGriff while newcomers to the ballot next year include Vladimir Guerrero, Jorge Posada, Manny Ramirez and Ivan Rodriguez among others. You seriously used a picture of him on the Marlins? Why not? You wouldn't be offended by something like that would you? If I wanted to post a photo of Mike Piazza, the one from his many years with either the Dodgers or Mets would've been more appropriate. He had a very brief cup of coffee with Miami. I can't say I'm surprised that Piazza & Ken Griffey, Jr. got the 75% or more from the Baseball Writers Association of America to get the calls to the Hall this summer in Cooperstown, NY. As a longtime baseball fan myself, I think it's petty that 3 writers didn't bother voting for Griffey. It's also ridiculous that the stuffed shirts with the BBWAA who no longer follow Major League Baseball still have Hall of Fame ballots. If they don't follow MLB like they used to, why bother casting a ballot? Also, what will the writers do with those from the steroid era accused of using performance enhancements? Will they keep them out? Will they eventually get voted in? 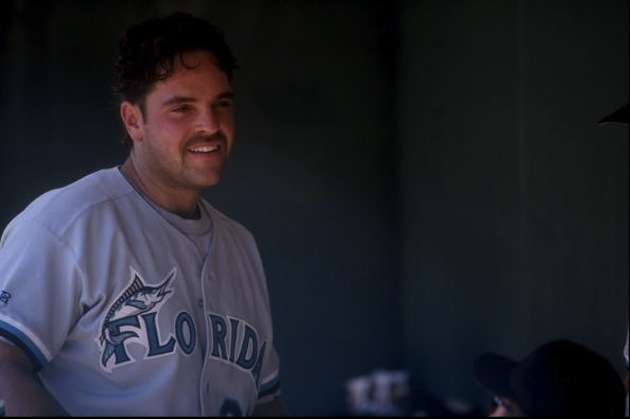 Well I put up a picture of Piazza in a Marlins jersey for the same reason why I posted articles last year with Randy Johnson in an Expos jersey and Pedro in a Dodgers jersey: to mix it up and do something different. To be fair with the BBWAA, they did cut a number of writers from the process who hadn't covered baseball in many years which was a pretty good move. And as I've said before, keeping guys out like Bonds and Clemens is simply a joke. Whether people like them or not, Roger Clemens & Barry Bonds played during a time in Major League Baseball when the powers that be were clearly asleep at the wheel, regardless if it was MLB "Commissioner" Allan H. "Bud" Selig or the MLB Players Association. They didn't test for PEDs back then. We all remember Don Fehr & the MLBPA were very reluctant to agree to such testing even though such testing has been a reality in other sports including the Olympics. It may have been fishy in the eyes of the American public back then, but I get the impression if younger BBWAA writers have their way, guys like Clemens, Bonds & Curt Schilling will eventually get inducted. This I agree with, although I don't know why you put Schilling in the same group of Bonds and Clemens considering there's no steroid taint with him. Guilt by association in the eyes of the American public as it pertains to Curt Schilling? I thought I remember reading & hearing Schilling's name also linked to this controversial era of baseball, too. It's debatable as is regarding whether Schilling's overall body of work is Cooperstown-worthy, but I think he'll eventually get in based in large part what Curt did for the Red Sox in 2004 & 2007 when Boston won 2 World Series titles. I don't think that's so because as I said, there's never been any steroid rumors regarding him. Not even the whisper crap like you've heard with Piazza and Bagwell.